And…we’re back! Apologies are in order, folks. It has been a long hiatus since our last post. So much has happened in that time but that is probably best left for another day. We were featured in the Star newspaper today (thanks for the interview, Grace!) so perhaps this is a fitting piece with which to kick things off once again. It wasn’t easy for Eileen Lian to fully breastfeed her daughter Andrea. When they dine out, Lian had to breastfeed in public toilets until her friend gave her a sling, which allowed her some privacy. That was 16 years ago, long before the furore over the recent TIME magazine cover that drew attention to the practice of attachment parenting, which emphasises close contact between parent and child. Despite the inconvenience, Lian was determined to breastfeed her daughter as she believes in attachment parenting. Breastfeeding is one of the pillars of this parenting approach as it is deemed the best way to satisfy a baby’s nutritional and emotional needs. Practitioners also believe in weaning the child when he is ready – be it at three months or three years of age. Some family members were supportive of Lian; they’d ask the restaurant manager for a private room for Lian to nurse her baby. However, there was also an aunt who hinted that powdered milk is a more viable option. “Whatever people said was not going to make a difference. 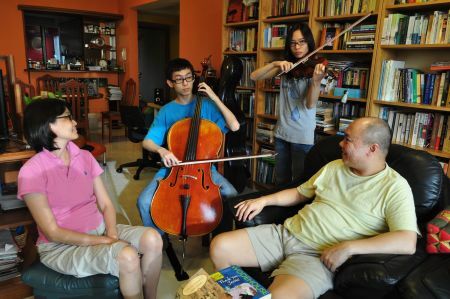 I was going to continue doing it anyway,” says Lian, 52, whose husband Dennis Sim also believes in hands-on parenting. Lian took it all in her stride because she knew how she wanted to parent her children. “When I had my first child, I chose to be a stay-at-home attachment parenting, breastfeeding and unschooling mum because I wanted my children to feel the joys of living and learning,” the mother-of-two writes on her website parenting-works.com. Lian used to be a magazine editor based in Hong Kong and Singapore, putting in long hours at work. But when she had her daughter Andrea, she decided her priority was to focus fully on the child’s upbringing. Also, it so happened that Andrea was born when the family moved back to Sim’s hometown, Ipoh. Lian was a full-time mother for 10 years, and only eased back into doing freelance writing after her children became more independent. “The simplest way to explain attachment parenting is to describe it as parenting from the heart. At its most fundamental level, attachment parenting means being responsive to your baby’s needs. It means following your baby’s cues and not artificial schedules that have been passed down from detached professionals. “Also called intuitive parenting, instinctive parenting, natural parenting, immersion parenting and continuum concept parenting, attachment parenting advocates keeping baby close to you most of the time, breastfeeding on demand, sharing your bed with baby, holding baby often and wearing baby in a sling,” writes Lian on her website. In the United States, this parenting style was popularised in the early 1980s by paediatrician William Sears, co-author of The Attachment Parenting Book: A Commonsense Guide to Understanding and Nurturing your Baby. It is rooted in the conviction that babies whose needs are fully met become more cooperative and agreeable, which makes for happier children and parents. This style of parenting is not foreign to Malaysian parents. Practices such as extended breastfeeding, sharing the bed with the child, and not letting a child cry on and on, are common here. In the United States, critics of this style of parenting say it’s too demanding and strenuous on the parents, and breeds dependence. But most practitioners say it’s not a one-size-fits-all approach, and parents are encouraged to adopt principles that work for their family. Among advocates of attachment parenting is Canadian-American singer Alanis Morissette, who thrives on building a close bond with her 17-month-old son Ever. She has said she’d continue to breastfeed him till he is ready to be weaned off. The longest Ever has ever cried before being picked up is six minutes, and he always sleeps with one of his parents. Lian and her husband started sharing their bed with Andrea when she was six months old. The sleep-deprived mother had nodded off in bed during a pre-dawn feed, and didn’t move Andrea back to her cot. They had a good night’s rest, and decided the baby belonged in their bed. When their son Joshua came along, there was no question of putting him in a separate bedroom. Attachment parenting proponents believe co-sleeping gives babies who have yet to develop the abilities to self-soothe a safe environment. One of the main criticisms about this practice is the risk of Sudden Infant Death Syndrome (SIDS), but there are guidelines for sleeping with children. Some experts have also pointed out that co-sleeping with children is common in many cultures, where SIDS is rare or even unheard of. 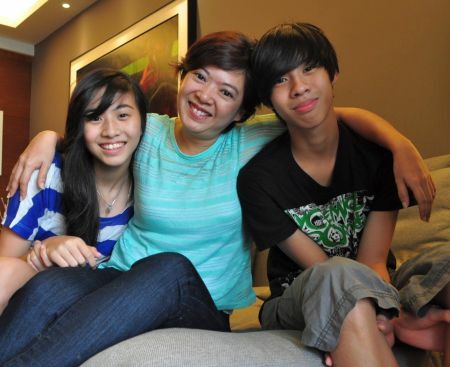 Andrea and Joshua are now in their teens, and they have their own rooms. Kindergarten owner Estella Tan, 41, also brought up her son Tristan, 14, and daughter Trisha, 13, using the principles of attachment parenting. “I had my children with me 24/7. They slept with me, were fully breastfed until Tristan was six months and Trisha, three months. From infancy I kept them on a strict routine of play, craft and reading. Thankfully, my husband was very supportive, providing a comfortable financial net for the family,” says Tan, who only went back to work on a half-day basis when Trisha attended kindergarten. When they started school, Tan was fully occupied with school runs and chauffeuring them for their various co-curricular activities. She supervised, and was involved in, their schoolwork. She made sure they did their work, but not through threats or coercion. Tan prefers positive discipline – one of the tenets of attachment parenting – whereby she tries to understand the root causes of her children’s difficulties. When her children threw tantrums, she’d take the time to talk to them to understand what was bothering them. Lian and Sim also believe in positive discipline. They do not spank or scold their children when they throw tantrums. Practitioners of attachment parenting believe children often communicate their feelings through their behaviour, and that problems should be resolved together in a way that leaves everyone’s dignity intact. Lian believes tantrums are manifestations of a child’s discomfort which can stem from hunger, sleepiness or uncertainty concerning things like schoolwork. Unlike most parents who determine what’s best for their children, the Sims have largely left theirs to make their own decisions, within boundaries, of course. “This began from Day One when they were fed on demand,” says Sim, 46, who practises energy healing and is a firm believer of alternative therapies. It is his belief that when the super-conscious highways of the mind are ready, the necessary transitions will happen. As it is, the children did not experience toilet-training nor were they forced to take up music lessons. “Joshua started to read by himself at age eight when he developed an interest in Spider-Man and wanted to look the character up online,” says Lian, who read books like Harry Potter and The Lord of the Rings to the children every night. The children were free to explore their interests. Joshua, 13, is into IT – he designed Lian’s website – and is taking up the cello, while Andrea, 16, plays the violin and is learning German. Positive discipline is, however, not about letting the children have complete free rein. Tan’s children are fully aware that issues such as bath time, homework and eating vegetables, or values including showing respect and consideration to others, are non-negotiable. Sim and Lian have established rules at home. One of them is limiting screen time to an hour a day, which applies to computer games, television or Facebook. To ensure that the rules are followed, Lian makes it a point to issue constant reminders and maintain a steadfast stand on family rules. The biggest parenting challenge for Lian and Sim is to let go of their expectations. But they believe in discarding the insistence that parents know best. Instead, they listen to their children and let things flow. “This way, they will be able to find things in life that will ignite their passion and lead to happiness and success,” conclude Lian and Sim. Tan is trying to seek a balance between protecting her children and teaching them to be independent so that they can look after themselves. Her children joke about her protective ways. They suspect she doesn’t leave straightaway after dropping them off at the shopping mall, but lurks behind pillars to watch over them. But Tristan and Trisha also consider Tan their best friend, and affirm she is their most ardent supporter at their school sports events. “My mum was supposed to film my run but when I checked, I found the camera was facing the other direction. That’s how excited she gets,” relates Tristan.